There are nearly 100 hereditary conditions that affect enamel formation. 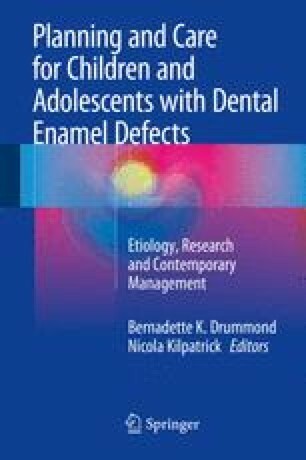 Hereditary enamel conditions not associated with other tissue or developmental defects are traditionally referred to as amelogenesis imperfecta (AI). Enamel malformations involve either a deficiency in the amount of enamel (hypoplasia), a decrease in the mineral content or change in the composition of enamel (hypomineralization), or a combination of these two manifestations. The different amelogenesis imperfectas are challenging to diagnose and treat as they are extremely diverse in their clinical presentation and are genetically heterogeneous. There are multiple genes now known to cause AI and these different genes code for proteins that are critical for normal enamel formation. Ten genes with mutations known to cause AI have already been discovered, and the powerful new molecular technologies now available will help identify new genes that are associated with enamel defects. Understanding the etiology of hereditary conditions affecting enamel and how the enamel differs from normal (amount and/or composition) will allow clinicians to better advise their patients and select optimal treatment approaches.